Hartford: "Utamaro and the Lure of Japan"
at the Wadsworth Atheneum museum of Art. For the first time in 130 years, two monumental paintings of Kitagawa Utamaro (1753-1803), one of the greatest artists of the ukiyo-e tradition in Japan, are united. The exhibition presents Fikagawa in the Snow, from the Okada Art Museum in Akone, and The Cherry Blossoms in Yoshiwara. 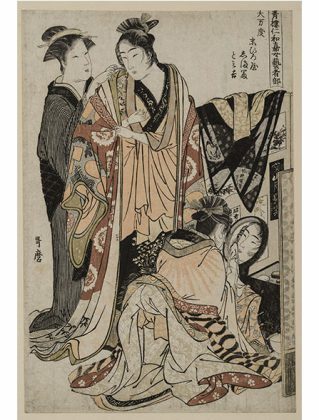 Utamaro is particularly known for his portraits of beautiful women and the two exhibited paintings specifically celebrate the courtesans who lived in the pleasure districts, famous at this time. In addition to the two emblematic rolls, the exhibition features more than 50 objects, including paintings, prints, textiles, porcelain and weapons from the collection of a thousand Japanese artworks of the ‘Atheneum museum.